I was starting to think I'd never see it. 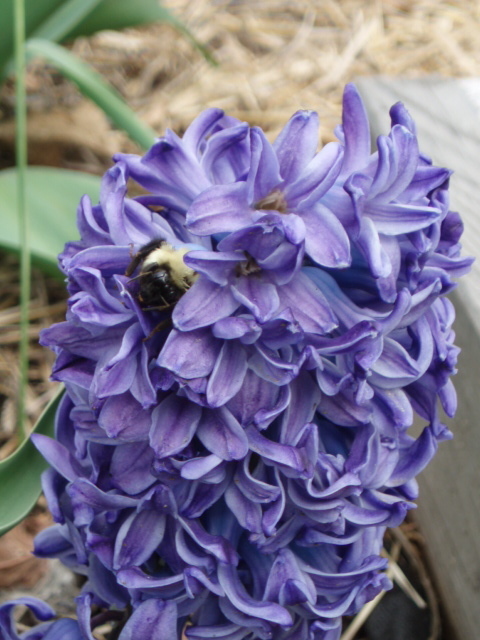 The bulbs in my garden are telling me that we're about three weeks behind. Normally I'd have had at least a few daffodils in mid-March. 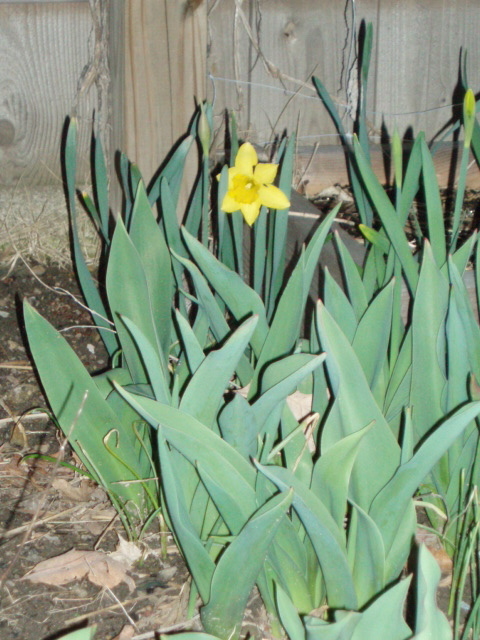 Anyway, for all my friends who scored "daffodil" on the flower quiz, here you go. We snapdragons will have to wait until summer. In other news, I spent last Friday planting the peas, lettuce, radish, and carrots in the potager. One of the nice things about raised beds is that the soil warms up more quickly than in the ground. I was able to plant with minimum mess (as those who know me well can testify, I can't do anything without making a mess). 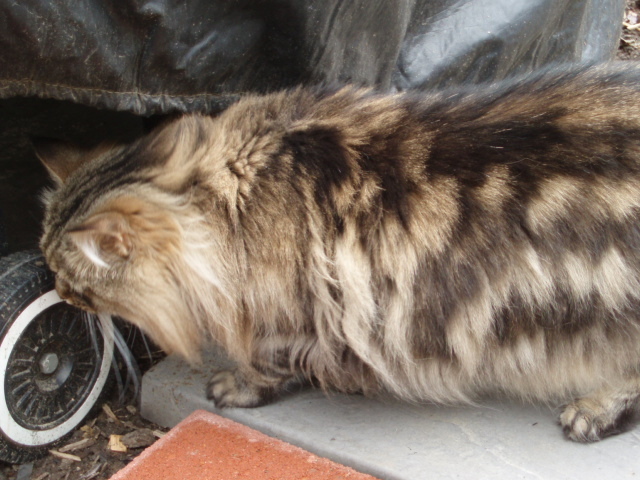 Big Lou sat by my side and supervised, occasionally trying to sashay into the raised bed to get a closer look. Next up, plant those tomato seeds I've been talking about for several weeks. Yesterday was the first day of spring, and we had some glorious weather. Brisk, sure, but blue skies and sunshine. After so much rain, the sunshine nearly made me giddy. Today skies were grayer, but the temperatures were in the low 60s. 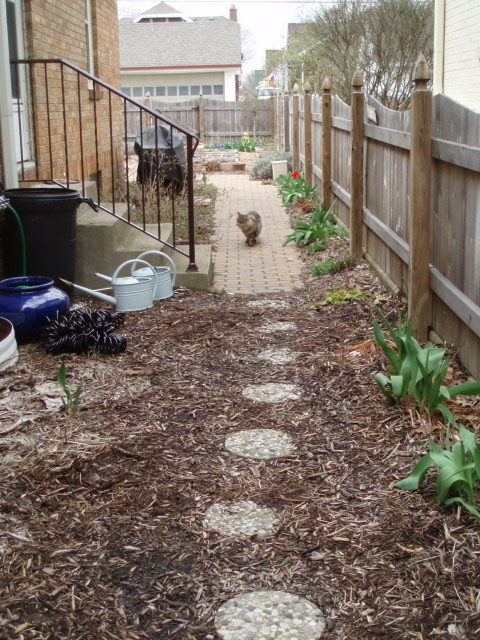 I took advantage of this short break in our regularly scheduled spring storms to do a walkabout in the garden. 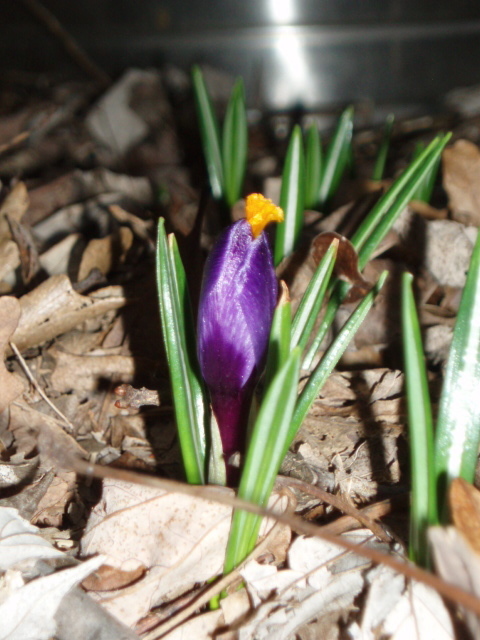 And I discovered the first crocus bud of spring! I was starting to think the bulbs were permanently confused. My tulips, daffodils, and crocus shoots all came up at the same time. Normally, I would have seen crocus before now, and the daffodils would be starting. Tulips are usually an April flower for me. 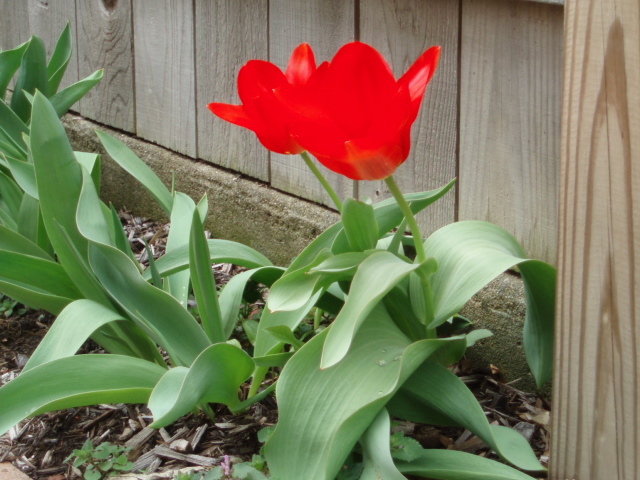 But for whatever reason, the tulip shoots are growing like weeds. It is awfully nice to see green in that sea of brown and gray. 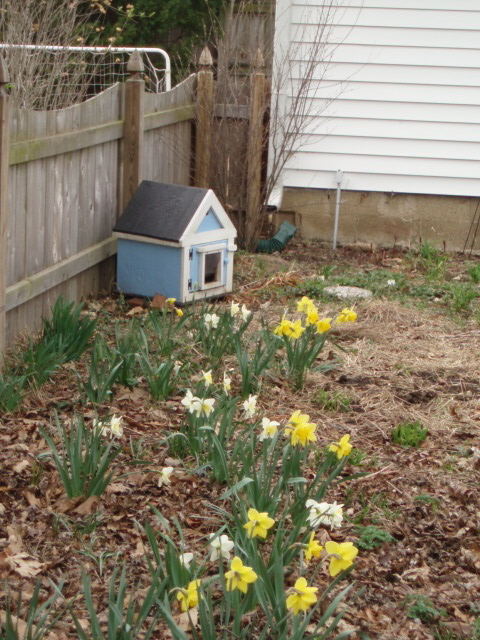 I planted daffodils in a sort of an S-shape in my perennial shade border. Now that the blades are up, it looks like a little creek of green running through the brown landscape. I cut the lavender back to shape it up. You're supposed to prune lavender after the "hard frost," which means after the last time the ground freezes. So I am choosing to believe that mud season is here to stay and the ground is not going to return to its previous tundra-like state. I cut the lavender back by a third, being careful not to cut into the woody part. As long as I prune only the recent growth, the plants shouldn't have any trouble greening up as the temperatures rise. 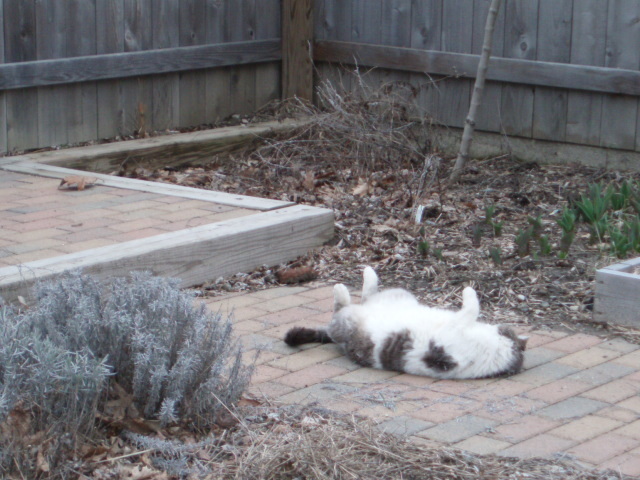 At left: Big Lou enjoys himself in the remains of the lavender prunings.